Tipsy Elves – the online retailer of ugly Christmas sweaters with a humorous twist – not only gained national media attention when it was featured in December 2013 on ABC-TV’s “Shark Tank” but a financial infusion from “Shark” investor Robert Herjavec. Following the successful “Shark Tank” deal, Tipsy Elves has expanded its “fun” approach into more than 20 clothing categories, including Hawaiian shirts and swim trunks, ski suits, patriotic clothing, Pride (LGBT) gear and Halloween costumes. 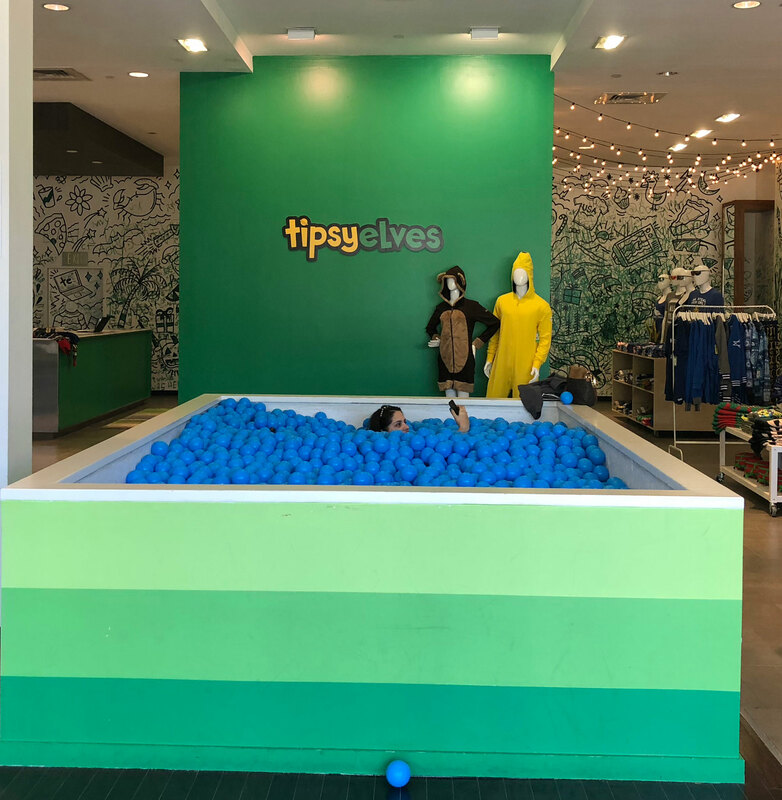 The company also has opened four Tipsy Elves’ pop-up stores across the country – including San Diego, Denver, Dallas and New York – and is soon to open an additional seasonal store in Santa Clara, Calif. 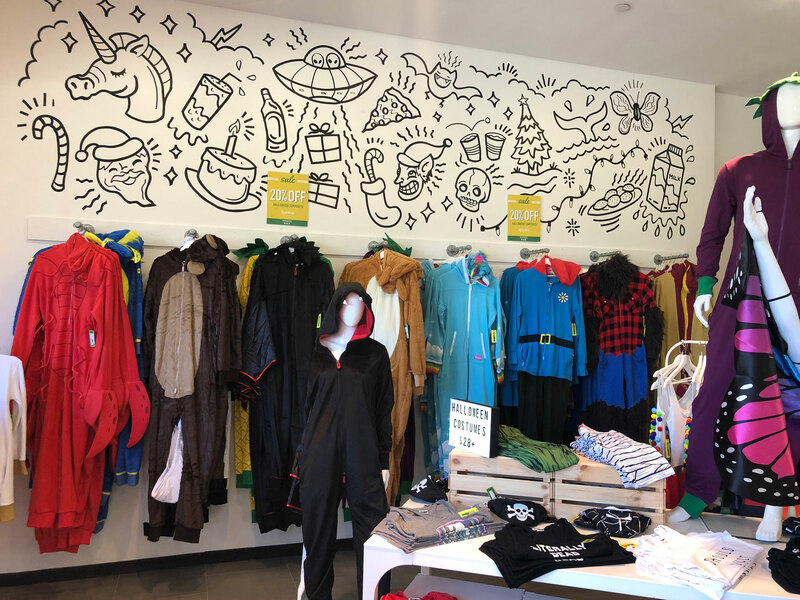 Nonstop Signs, Inc., of Los Angeles, a division of San Diego-based 858 Graphics and an industry leading graphic design, print and sign business, began working with Tipsy Elves in 2015 to create pop-up store signage and graphics. When Tipsy Elves had the opportunity this summer to move to a superior location featuring an exterior entrance at the Westfield UTC mall in San Diego, Nonstop Signs turned to Dibond® aluminum composite material by 3A Composites USA to create affordable exterior signage that could weather the elements. 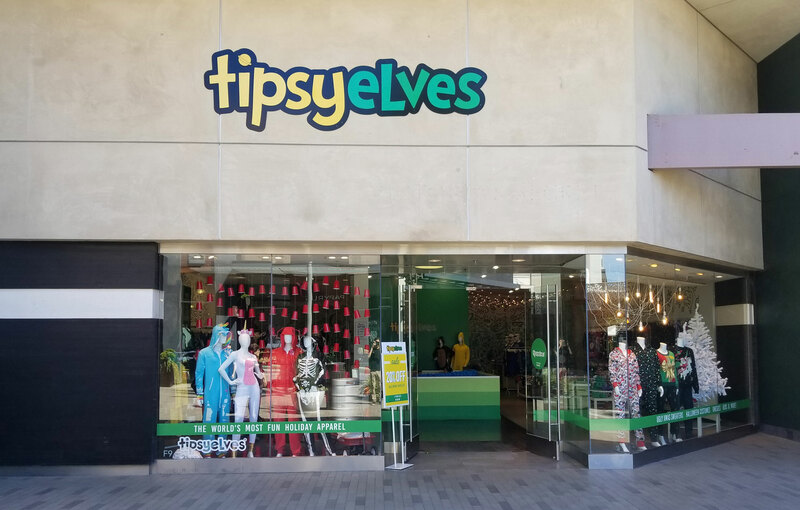 Not only would this Tipsy Elves’ retail location do business longer than previous seasonal pop-up stores – with an opening in August 2018 – it would be filmed for a “Shark Tank” success story episode. Tipsy Elves’ design team developed multiple concepts for store signage, according to Cole Canedy, chief operating officer, 858 Graphics. Nonstop Signs utilized 3mm black Dibond 4-by-8 foot sheets to fabricate a two-layered Tipsy Elves exterior sign, which was cut with a CNC router. Black Dibond panels forming the base layer were seamed together to create the 14-foot wide by 27-inch tall sign. An Oce Arizona 460 GT flatbed printer was used to direct print Tipsy Elves’ lettering in both white and colored UV inks on black Dibond. The CNC-routed cutout lettering was adhered to the black background Dibond layer with 3M 4919F VHB self-adhesive tape. The finished sign was installed directly above the store’s exterior entryway with concrete screws. Nonstop Signs also turned to 3A Composites’ graphic display boards to create additional store signage for Tipsy Elves. Sintra® PVC board by 3A Composites USA was selected to direct print a smaller non-dimensional version of the exterior sign for interior installation. Sintra in the Bright White color and 3mm thickness was direct printed and CNC routed to create the 6-foot wide by 2-foot tall sign for wall installation with 3M 4919F VHB self-adhesive tape. Additionally, 3mm Bright White Sintra PVC board was selected for direct printing promotional 12-inch by 16-inch point-of-sale signs placed about the store as well as a 22-inch by 34-inch sign positioned in a metal frame at the store’s entrance. This Sintra sign extends above the metal frame to display Tipsy Elves’ logo, while smaller printed card stock is inserted on either side with changing promotional messages. 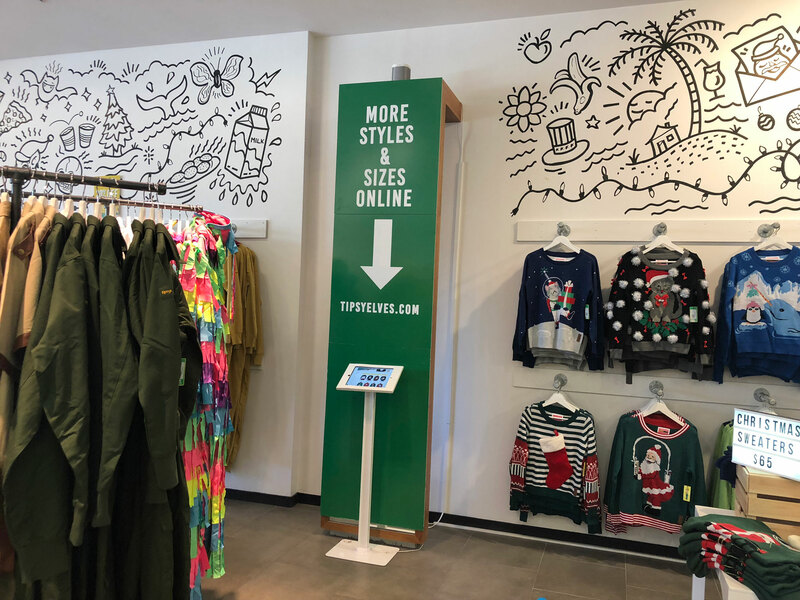 Fome-Cor®, the original foam-centered board by 3A Composites USA, was selected for direct printing a 9.5-foot tall by 28-inch wide sign for installation above a kiosk that allows customers to search for additional styles and sizes available from Tipsy Elves’ online store. Bright White Fome-Cor board with clay-coated paper liners in the 3/16-inch thickness was direct printed in three sections with a seasonal holiday green background and white lettering and graphics. The sign sections were abutted one above the other and adhered to a wooden frame with adhesive. Additionally, Bright White Fome-Cor board in the 1/2-inch thickness was utilized to direct print a non-dimensional Tipsy Elves’ logo sign with CNC-routed lettering. The 6-foot wide by 2-foot tall sign was positioned on a wall near the store’s ball pit play area. Nonstop Signs purchases its 3A Composites’ graphic display boards from the San Diego branch of distributor Piedmont Plastics. 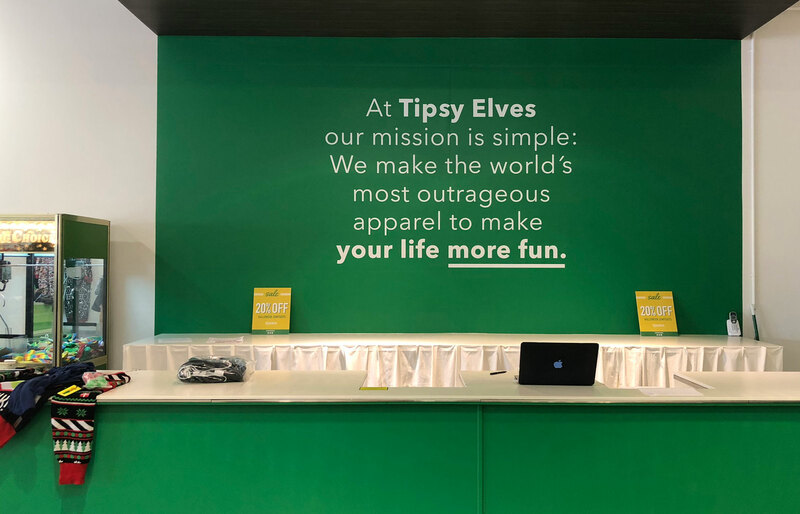 Nonstop Signs completed the retail location’s signage and graphics program by printing self-adhesive vinyl graphics for installation on storefront windows and Tipsy Elves’ mission statement for an interior wall. 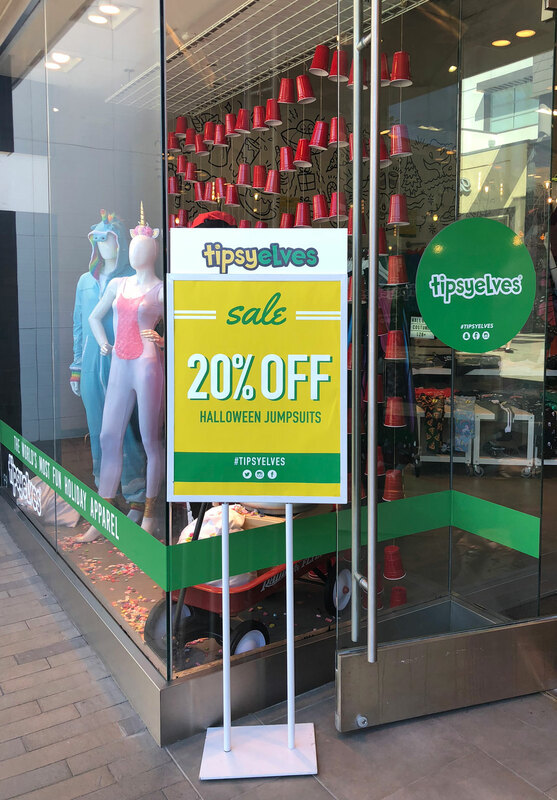 The Tipsy Elves San Diego pop-up store is generating a great deal of attention, according to Canedy, who said the company has ordered additional signs for more locations. Photography courtesy of ©Nonstop Signs, Inc.